Sadie is producing & presenting (as herself and Miss Adventure) a one-hour comedy podcast, Fake News. 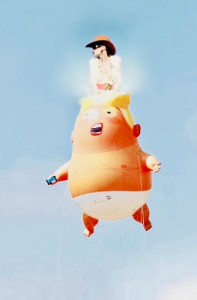 The mockumentary sees shambolic presenter Miss Adventure embark on an unlikely adventure in the USA with US President Donald Trump and the t*t he’s referred to as “Mr. Brexit”, Nigel Farage. The previews have already gone down a sh*tstorm. The podcast airs on ‘Brexit Day‘ (Oct 31 or TBA).